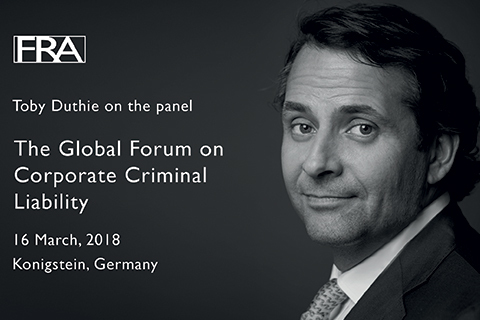 One of FRA’s Founding Partners, Toby Duthie, spoke at the Global Forum on Corporate Criminal Liability in Germany, on 16 March. Toby spoke on the anatomy of a healthy compliance program alongside Elizabeth Radigan from Diebold Nixdorf. They used US and international regulators’ guidance documents to draw on vast in-house and external counsel experience. Toby and Elizabeth explored the details of what makes a good compliance program run effectively whilst allowing the business to grow and what will stand up to government scrutiny. Culture, culture, culture – tone and the top and tone in the middle to drive change.